WASHINGTON — Metro has revised upward the amount of additional money it needs from local taxpayers in the current budget year, even as it looks ahead to potential service improvements next summer. Union raises that Metro decided not to budget for in order to improve its negotiating position— but still knew were likely— require a total of $51.1 million for the budget year that ended this summer and the budget year the transit agency is in now. Metro’s last revision of those numbers had put the total at $48.2 million. In addition, the Metro Board’s Finance and Capital Committee is set to be told Thursday that costs, including raises for drivers for the privatized MetroAccess service, require $36.5 million more for the current budget year. Metro awarded new MetroAccess contracts, effective July 1, that are providing service projected to go beyond the originally budgeted costs of the program. “MetroAccess faces increased costs to obtain drivers in a competitive market caused by the transportation network companies,” a briefing document said. “Transportation network companies” are a technical way of describing ride-hailing services such as Uber, Lyft and Via. 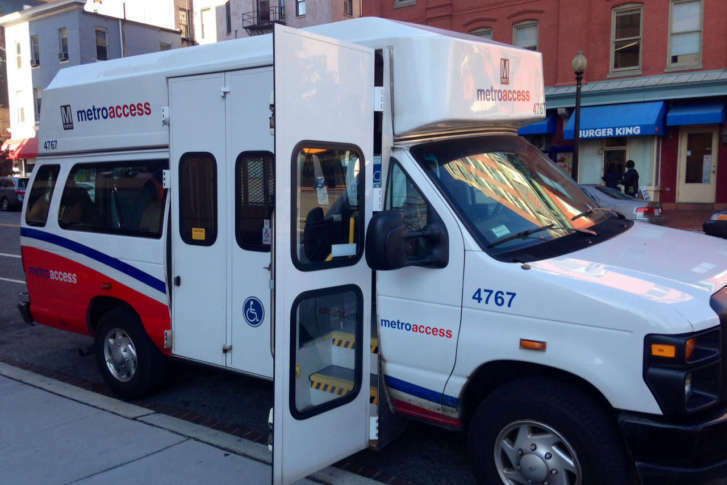 MetroAccess paratransit trips cost Metro significantly more than other rides, so Metro is planning to expand the Abilities Ride program that provides cab rides for some trips and to try to make more paratransit trips with multiple riders in the van. MetroAccess riders, however, already complain about trips that can be roundabout and leave them on the vans for extended periods. Combined, the raises and MetroAccess changes make the total additional costs to jurisdictions $87.6 million; $22 million is required by Jan. 2, and the remaining $65.6 million is due by July 2. The District owes approximately $27.1 million; Maryland, $40.3 million; Fairfax County, $12.1 million; Arlington, $4.8 million; Alexandria, $2.7 million; the city of Fairfax, $300,000; and the city of Falls Church, $200,000. With the additional funding, the total operating subsidy in the current year’s budget would be $1.0794 billion. Metro General Manager Paul Wiedefeld’s budget proposal for the year that begins next July requests a $1.182 billion operating subsidy from local taxpayers, including $20 million specifically for some service improvements. That would include an increase of up to 7 percent for the District to $419 million and 6.7 percent for Maryland to $441 million. In Virginia, local governments would see an increase of 8 to 10 percent under traditional calculations, to total $322 million as Loudoun County joins to pay startup costs for the new Silver Line extension to Dulles International Airport and Loudoun County. Construction overseen by the Metropolitan Washington Airports Authority is expected to be completed late next year. Metro’s budget assumes the monthslong process to include turnover of the rails and stations, training and hiring. Additional Metro ramp up costs will begin then as well. An alternative Metro subsidy calculation under consideration would have Fairfax and Loudoun counties bear nearly all $37 million of those ramp up costs, which would increase Fairfax County’s contributions by 19.9 percent next year to $179 million. Loudoun County would pay only its $18 million in ramp up costs under that plan, and would not be responsible for approximately $2 million in other costs it would pay under the other formula. In that situation, Alexandria, Arlington and the city of Falls Church would see smaller increases of 5.3 to 6.5 percent; D.C.’s operating contributions would increase only 4.9 percent to $411 million, and Maryland’s contribution would still be $441 million. A third version of subsidy calculations under consideration would exclude Loudoun County from any costs related to regional Metrobus service, lowering Loudoun’s contribution next year to $15 million if Silver Line ramp up costs are distributed across all jurisdictions. The extension to Ashburn will add to the five Silver Line stations over 11.7 miles that opened in July 2014.